Lieutenant Killian Jones lines the sailors up to prepare for the Captain’s arrival. He confiscates rum from one of them telling him that drinking leads to bad form. The Captain arrives. He is Killian’s older brother. The Captain tells them they will be setting sail on a mission from the King. Killian and his brother look at star charts. Killian realizes they are heading to a strange land as he does not recognize the constellations. Enemy ships approach and begin firing. The Captain has the men raise a sail made of feathers. The feathers are from Pegasus and allow the ship to fly. The ship flies to an island. The Captain explains that the King is looking for a plant that has incredible healing properties. A boy approaches them and introduces himself as Peter Pan. When the two sailors explain what they came for Pan tells them that the plant is actually one of the most poisonous plants there is. The Captain does not believe Pan but Killian now has doubts. The Captain and Killian argue over the Dreamshade. Killian does not want to help the King wipe out an entire race. Still not believing Pan the Captain uses the Dreamshade to cut himself hoping to ease Killian’s suspicions. At first nothing happens and then suddenly the Captain falls. Pan approaches Killian hovering over his brother’s body. He begs Pan for help. Pan parts vines and reveals a spring. He explains that the spring water has healing powers for anyone who drinks it but warns him all magic comes with a price. Killian retrieves water and brings it back to his brother. The Captain wakes up. Killian looks around to pay the boy but Pan has disappeared. The ship flies back toward home. Inside a cabin the Captain tells Killian he should have listened to him. Once away from the island the Captain again collapses. This time Killian cannot save him. The sailors announce Killian as their new captain. They give him his brother’s satchel. Killian announces that they will no longer work for the corrupt King. They will do whatever they please and be pirates. The sailors rip their jackets off and cheer. The Lost Boys carry torches as well as a cage containing a drugged and passed out Neal. Back at the campfire a boy taunts Henry with a wooden sword. At first Henry does not want to fight but then gives in. Pan interrupts and encourages Henry to use his mind to transform the sword into a real one. After some persuasion Henry battles the boy now with a real sword. The fight ends once Henry slashes the boy’s cheek. Henry apologizes and Pan tells him not to. The Boys cheer for Henry who begins to enjoy it. Hook and Emma move a mattress. They find markings on the wall that reveal Neal counting days he was stuck in Neverland. Emma believes Neal stopped marking his time once he gave up hope. She did the same thing as a child in foster care. She wants to get a sign to Henry that we are here so he does not. Hook tells Emma that he had once lost hope too. 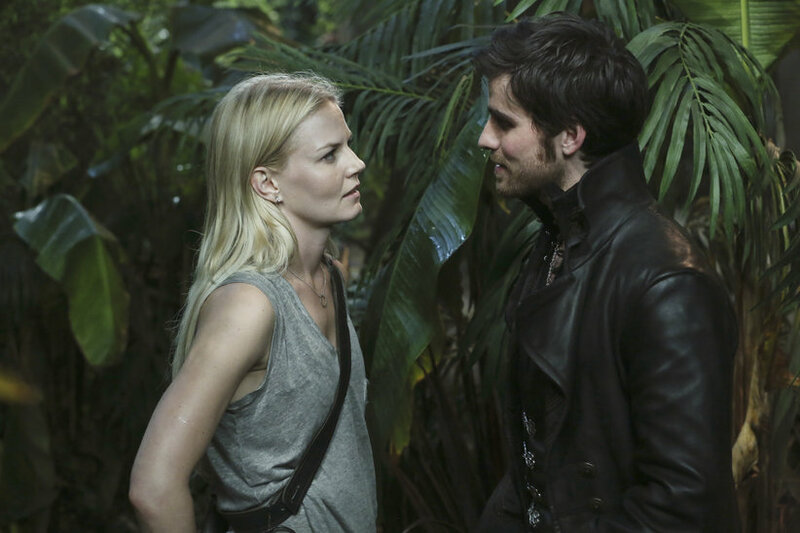 She does not react to this and David tells Hook that Emma will never want him as he is just a pirate. We begin to set a trap for one of the Boys. We are running low on rope. David tells Hook to come with him to get more. Once away from the group David warns Hook to stay away from Emma. David tries to punch Hook and passes out. Hook uses alcohol in David’s face to wake him up. He tells David to lift his shirt. The poison is traveling close to David’s heart. David finds a pouch on the ground that says Jones. He gives it to Hook who tells him it had belonged to his brother who lost it battling Pan. He then tells David he has an idea that may get them off the island but it would be too dangerous. David asks him what it is and Hook tells him his brother’s sextant may be somewhere there. Hook and David return. They tell us they will go alone to find the sextant. They tell us to stay behind and work on sending word to Henry. David tries to be brave. He tells Emma to let Henry know his grandpa loves him. He is also strange with Mary who takes it as fear and tells him not to worry that he will make it back. We take position waiting to trap a boy. One comes by and Mary shoots an arrow causing the net to drop on him. We approach the boy. I offer him an Apollo Candy Bar telling him I am sure he would love something sweet. He smells the chocolate and then tosses it away. Even after we offer to save him from this place he tells us he loves it here. Emma questions how he could love it with what Pan did to his cheek. We are shocked to learn Henry is the one who cut him. David asks Hook to make his family believe he died a hero and not from poison. He asks Hook who it was that he lost and if it was his brother. He tells Hook he once had a twin brother. David searches for the sextant and Hook stays on a hill holding rope. Pan approaches Hook. He wants to make a deal for Hook to do his dirty work in exchange for letting him leave the island. He sweetens the deal by telling Hook he can bring Emma. Hook tells him Emma will never leave her son and Pan reminds him she once did. He tells Hook to kill David before the poison does to show him he will take the deal. David has made his way back to the top and Pan disappears. He asks Hook who he was talking to and Hook tells him it was just to himself. The boy tells us Henry is vicious. I tell Emma and Mary I want to take his heart so that I may control him. Of course Mary is appalled. I am surprised to find Emma on board. She holds Mary back while I take it. Emma then apologizes to Mary. I tell Mary this is why I am here. I take out a compact and split it in two giving the boy one of the mirrors. I explain we will use it to see Henry. David tells Hook he heard Pan and the conversation. Hook then tells David he planted the pouch and that there is no sextant they are looking for. He also admits he was not honest about his brother. The boy approaches Henry who backs away. I use the boy to talk to Henry telling him that we are here. Henry accuses the boy of lying because Henry cut him. The boy then gives Henry the mirror. Henry cannot believe it when he sees the three of us. We tell him we are here and we are coming for him. Pan returns and Henry tosses the mirror. Hook cuts away the vines and brings the magic spring water to David. He explains David would have never come if he had told him why he wanted him up there. He explains that this water will heal him but the catch is the magic can only save him on the island. David drinks it anyway telling Hook it is worth it if he can save his grandson. He asks why Hook would risk this to help him and Hook tells him it is not for him. David and Hook return to us. David tells us that Hook saved him from almost getting hit with a poison arrow. David and Mary kiss. I walk off. This leaves Hook and Emma alone. She thanks him for saving her father. He implies he wants more. Emma grabs Hook and kisses him. After they kiss she tells him it was a one time thing but she smiles as she walks off. Pan comes to Hook. He mocks Hook for thinking that kiss meant something. He then tells Hook that Neal is alive and on the island. He threatens Hook that he will tell Emma. It wasn’t the greatest episode by no means, but it wasn’t the worst either. I have come to the realization that we are probably going to be in LOST mindless jungle treks for the better part of the season. I have had to come to terms with it because what else is there to watch on Sunday at that time??? Besides they have to get out of it at some point before the show is over. I hope anyways!!! So I wonder if Hook will lay off of Emma now that he knows that Nealfire is there too??? I personally think he will keep trying till she finds out for herself that he is there. Then he will just play dumb about it when she does. Or say something like, “Ya can’t blame a bloody Pirate for trying!! !” Because no matter what Hook is gonna be Hook!! !